Visit the Best Palace Film Locations throughout Europe. Here is my personal list of best historical film locations and a guide to the palaces and castles where these scenes were filmed. Some you can visit, some you can even have dinner or spend the night. The Palace of Versailles is the locations of many historical events, and therefore starring in many block buster movies. My two most favourite films shot at Versailles Palace are Marie Antoinette (2006) and Farewell, My Queen - Les Adieux à la Reine (2012). One of the grandest European palaces starring in one of my favourite historical films. The movie "Marie Antoinette" by director Sofia Coppola tells the story of the Austrian Archduchess Maria Antonia. Starting at age 15, when she arrives at the Versailles Palace to marry the Dauphin of France (the later King Louis XVI) until the moment the couple has to leave the palace during the French revolution. The best about this movie is just the mere beauty of it all, and the fabulous soundtrack of contemporary music that does just fit into the scenes. A movie that gives an even more realistic view of the life at Versailles Palace during the first days of the French Revolution is Farewell, My Queen - Les Adieux à la Reine by Director Benoît Jacquot (2012). It tells the story of the personal reader of Queen Marie Antoinette. Based on the book by Chantal Thomas, we follow Sidonie Laborde a couple of days during the start of the French Revolution. We share with her the last days at the court of Versailles in a tense atmosphere of anxiety and confusion that must have prevailed at that time. This movie not only shows the magnificence of the Versailles Palace, but takes us to the tiny filthy and overcrowded servant's quarters, to the chaotic kitchens and the rooms full of gossiping courtiers. Farewell, My Queen, in the picture you see Marie Antoinette and Gabrielle de Polignac. Sidonie is in the back ground. A lot of the scenes are filmed at Versailles Palace during closing hours. 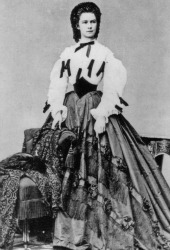 Sidonie is a fictional character, but all the others at court are historic figures. 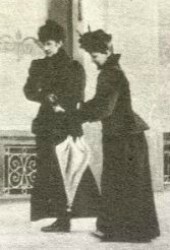 The movie revolves mainly around Sidonie and her devotion towards her Queen. And, in her turn, Queen Marie Antoinette's devotion towards her favourite friend the Duchess Gabrielle de Polignac. 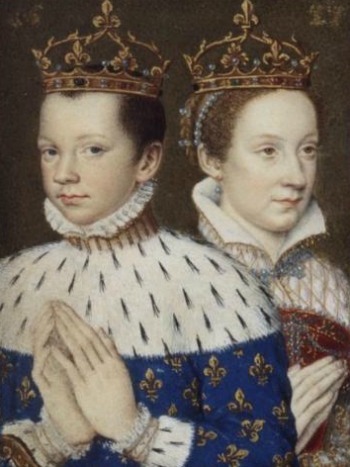 The tense and for the Royal family, very disturbing period just before the French revolution is well displayed. Reign, the TV series about Mary Stuart, queen of Scots, is not my favourite series. It is just not historical accurate enough. 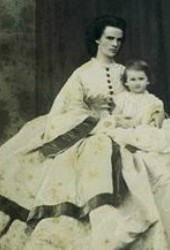 The dresses, although they are lovely, they're not the ones that were worn at court in the 16th century. The characters are not accurate either, non existing half-brothers and princess from foreign counties wooing Mary all the time. And that palace where the French Court of king Henry II of France and his wife Catherine de' Medici is filmed; it just looks a bit too much like a fairly tale castle to be real. It must be fake! Or isn't it? After some digging on the web, I found the palace film location is a real Castle, and it is like a fairy tale! It is not located in France though. Ashford Castle, where the French court scenes of Reign are filmed, is a five star-hotel in Cong, County Mayo, Ireland. In 1951 the hotel had been the location for another film; The Quiet Man, starring John Wayne and Maureen O'Hara. You can watch this film in the luxurious cinema of the hotel, or explore the castle grounds for scene locations from the film or the TV series. 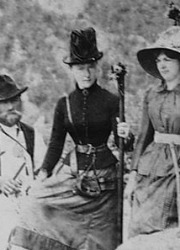 You can also go horseback riding, pet the Irish Wolfhounds, join the falconry or spend your day in the billiard room, in other words, just the pass-times that royals used to spend their days with. 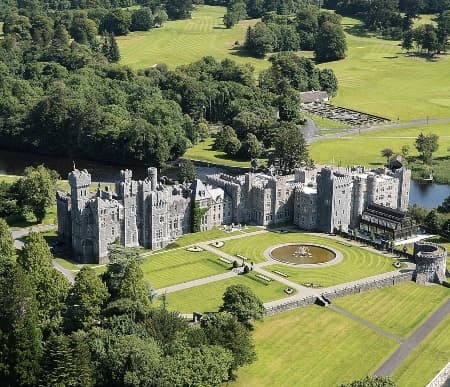 And, since the hotel staff still treats every visitor like royalty I am certainly putting Ashford Castle Hotel on my bucket list! 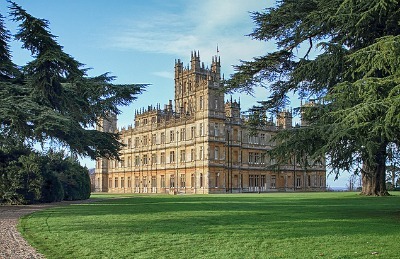 Highclere Castle is the location of the wonderful TV Series Downton Abbey. The series portrait the whereabouts of the aristocratic Crawley family, but also focus a lot on the servants. Both the people upstairs and downstairs are struggling through live in the tumultuous period just after the turn of the century (the twentieth century that is). Their lives often intertwine and you get a good picture of the class difference that rules all lives back then, not only between master and servant, but between all layers of society. The estate of the fictional Earl and Countess of Grantham is in fact the home of the real Earl and Countess of Carnavon. They open the doors to their castle some 60-70 days a year, mainly around some important holidays. You can check the official website to find out when you can visit the Highclere Castle. You can also book a 'Downton Abbey' tour from London, or combine visiting Highclere Castle, with a tour of Blenheim Palace, a UNESCO site in the county of Oxfordshire. If you think the name Carnovon does ring a bell when you have a little interest in ancient Egypt, you are right! The 5th Earl of Carnarvon was the one who, together with Howard Carter, discovered the Tomb of Tutankhamun, the Egyptian pharaoh, in 1922. They worked 16 years together before this magnificent find. In the cellars of Highclere Castle you can visit an Egyptian Exhibition. You can find ‘real' Egyptian antiquities, replicas of the treasures found at Tutankhamen's tomb and ‘The Path to Discovery' telling the story of Carter and Carnavon looking for the lost tomb. Sissi, Sissi: The Young Empress, Sissi: The Fateful Years of an Empress, by director Ernst Marischka. When Ernst Marischka, the director of the famous Sissi films, was looking for the perfect film location for Schloss Possenhofen in 1955, he could have chosen the real Schloss. This palace has not changed a bit since Sissi left to get married to the Austrian Emperor. In Marischka’s opinion though, the original location was just not idyllic and fantastic enough! 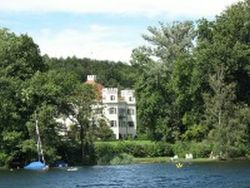 He found another palace, Schloss Fuschl, beautifully located on the banks of lake Fusch, which could easily pass as lake Starnberg in Bavaria where the real Schloss Possenhoven is located. Schloss Fuschl is now a luxury hotel where you can stay in the same room where Romy Schneider slept when they were filming here. Or you can choose the Franz Josef Suite or one of the Tower Suites.